Sometimes when I spend a week or more at the farm (that's my house in Eastern Washington) even small events seem a little bigger than they ought to be. A package at the door from UPS? You'd think it was Christmastime. In my studio picture above, taken with the point-and-shoot that I call "Sparky", the keen of eye will spot a nice overview of my current works. In the upper left is a small Rothlo Response; upper right see a medium sized work of my Colorist American Landscapes; at the lower left is a color study in my sketch book. Groovy stuff, but the big news is that I just got my new set of pastels! I know, I know - I told you I was house happy! 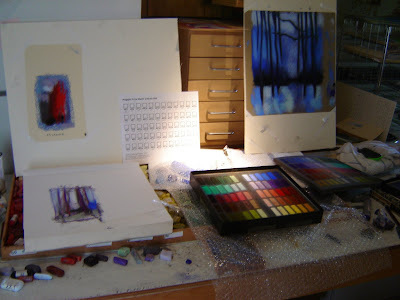 I have been meaning to try Terry Ludwig's pastels for some time now, and I had just discovered that my ultramarines seem to be scattered about between my studio tray and various plein air boxes. I am working in all blue landscapes, and couldn't seem to put all of my intense ultramarine blues together. My first-line sticks in blue are my own homemade and my Diane Townsend Terrages. I'm pretty sure I can't find the time to get down to the basement and roll some blue sticks any time soon, so I decided to give Terry's pure tones set a shot. This set is the Maggie Price Basic Values Set of 60. I can use the colors in his set to register the colors that I want to make myself (excuse meter: moderately high). Note the nifty color chart they included for registering the colors. Nice touch. I gotta get out of the studio for a while! This is one of my recent Rothko responses. I did another two this morning (photos are pending). 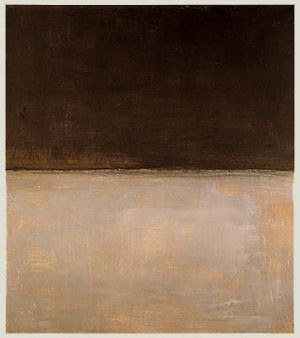 Rothko indicates that abstraction is the ultimate end "type" of art, which is a main theme in Abstract Expressionism. Obviously, art has moved on from then (the Forties and Fifties through roughly the early Seventies), and artists are producing realist work again. We'll get into DeKooning later, who had to explain to his peerage why he went back to the figure instead of pure non-figurative abstraction. Link here to Wiki on abstraction, and here to ArtLex definition, which you must scroll or page to under the letter "a". Anytime you say that "thus and such" is the last word on something, you get into trouble. I don't blame the AEs for looking for the ultimate definition of art, since the urge to be your best is what takes even artists to the top of their field. Certainly that happened for this group of American painters in the post-war years. And, since they insisted on being "of the age", they did feel apocalyptic overtones to their time. Think: Atom Bomb. Pollock brought that up in a famous quote, and the times also were influenced by the overwhelming and then-present effects of the Second World War. Of course they needed an end-all art, since maybe they were in an end time. But, when you get over the apocalyptic hump, you return to the studio and make some art. Will it be realist, or abstract? 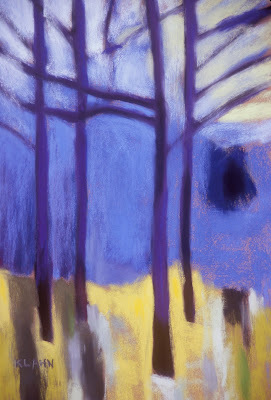 There are shades of each, and abstraction can be at the level of the idea, not just the subject or style of a painting. Today we live in a post-abstract world, where new things have to be created for art to flourish. Is there something new for abstractionists to say? I think so. What about realists. Of course there are new things to say! William Lehman has a good brief on the whole mess at his post: Design VS Art. There must be a gremlin in my Blogger site. In order to get my inexplicably lost avatar back, I had to post an image to Yahoo, then Flikr, then Photobucket, and nothing would "take". I suspect blogger, but now I'm afraid to delete the "Avatar" post for fear of offending the Blogger Gremlin. BTW, Photobucket does have a slick method of copying a URL, HTLM or whatever for each photo. It looks easy to use, except on the Blogger side I can't confirm that! Here's a "bump" of this one, taken with the D80 instead of scanned. I have completed a few other Rothko responses which I'll be posting over the next few days. Still wrestling with the great artist's philosophy (Mark Rothko). Amazon solicited a review today, since I bought it from them. How slow can I be? Actually, I'm getting up at 4:30 AM these days in order to get some studio time before the "Daddy Day Care" opens at shortly after 7. Maybe the old guy's art philosophy is starting to sink in, after all. 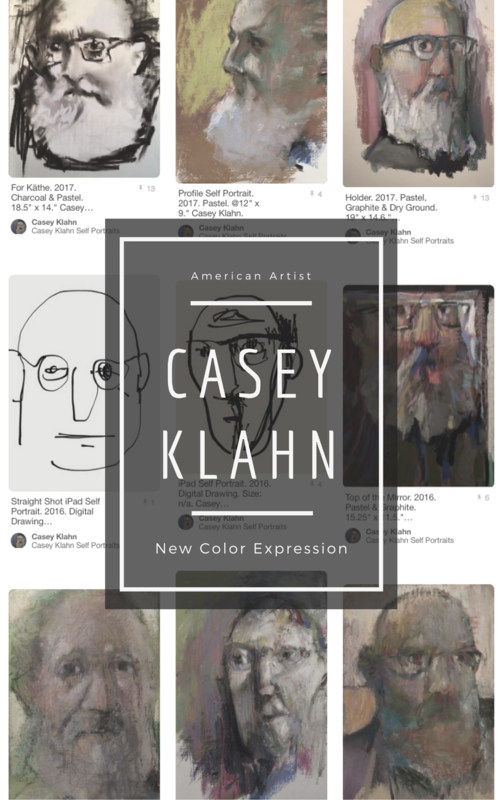 ...I wanted to start 50 drawings and now I have an idea to turn this blog ( 100 Paintings) into abstracts, but my regular stuff is so engaged at the art fairs that I think I want to go back to staying focused. And, my reading of the Abstract Expressionists is proving to me that a unified content in my art expresses a better philosophy of art. Not that I couldn't express my art philosophy some other way. It's just that a unified "look" keeps me focused on growth and getting better. It's coherent, like, ya know? And, being at the art fairs lets me see my work all at once in one place (instead of packed in boxes at home). It creates quite an impression. A unified corpus of work makes a powerful statement to collectors and gallerists. Even the casual observer sees it, as well. My art has stood with similar (not the same, but closely styled) palettes and subjects for about two and a half years, now. It makes a big difference. 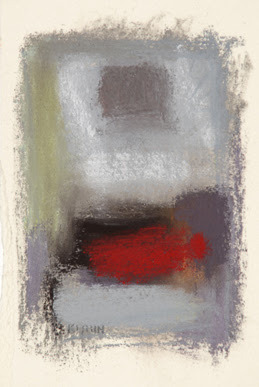 After reading a very interesting post on Rothko, links and all, I am getting more and more Rothko-ized by the day. Because I want to create a few really excellent posts, I'll be taking a little time to write them well. Be patient, dear readers. 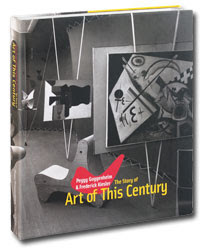 Peggy Guggenheim & Frederick Kiesler, The Story of Art of This Century, by Davidson, Rylands, editors. Link. AOTC was the famous gallery that Peggy Guggenheim established in the Forties and where she was instrumental in launching the careers of many (if not all) of our Abstract Expressionists. Kiesler was the architect of the far out gallery space that became a hang-out for the avant-garde of the art world. I had the strange experience of (unknowingly) visiting the location of the famous gallery at 20 West 57th Street in NYC. The actual place (Washburn Gallery ?) is a story or two above the Ameringer-Yohe Gallery, where I went to pay hommage to Wolf Kahn's pastels. During the same trip I bought a book at the MoMa that identified the location's place in history, and I thought about the serendipity of my chance visit. On Monday, after the fair, I did a gallery "run" through downtown Seattle. It's like a gallery walk, only a lot faster. I'll let you know what I saw a little later. Of course, I had to duck the flying fish! I am here in Edmonds at the fair. All is well and it's raining like crazy. May get the good gallery referral I have been after. apparently without a cigarette in his hand. Welcome to Katherine's readers. We have been spending a great deal of time on the Abstract Expressionists, who are a major influence on my own art. Jackson Pollock came first (complete with movie review) and we are still in the middle of studying Mark Rothko. 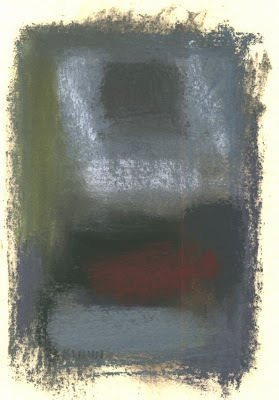 The Rothko book from the grave has been a terrific influence on me . It has helped to widen my own philosophy of art. I'll need a little more time to be able to write about it though. In the meantime, I refer you to the best review of the book that I've read by Sheldon Nodelman in Art in America. Art and philosophy, for Rothko, are parallel enterprises, the only two human activities that aim to articulate a totalizing representation of human reality. 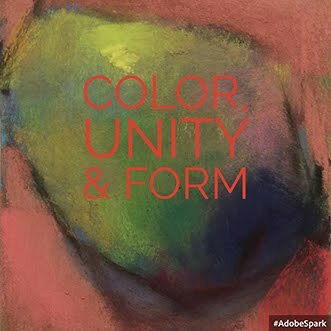 They alone have the full capacity to "generalize"--a term of great significance to Rothko--i.e., to ascend from particular experiences toward universal truths. For Rothko this reality was dual-natured, objective and subjective, embracing equally both the circumstances of the world in themselves and the human experience of and imaginative response to them. The artist's mission is to reduce all experience, external and internal, to its essential unity. Rothko insists on the need to keep this goal firmly in view and to differentiate between true art--an activity defined by artistic intention--and its pseudomorphs proliferating in the contemporary world, all those appropriations of its techniques and languages for merely instrumental ends that we now call "visual culture." This is a response to my Rothko research. I'd like to do more of these. I know it looks moody to some, but you have to remember that my personal response to gray is 180 degrees opposite yours. I grew up under a cloud, you see. Gray is my comfort color! When thinking Rothko, I think of Myth and Tragedy. Those were two of his benchmark meanings for art. You are a patron who has seen me at an art fair, and want to do some follow-up research of my art fair life. 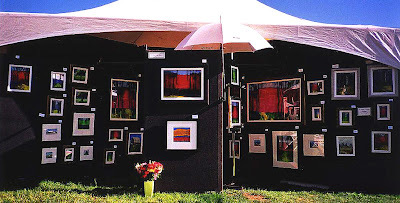 You are an artist who either does art fairs or who is seeking information about them. You have received an e-mail or a post card from me and want to preview the fairs. You are a rolled-up hippie from the Sixties who thought you would find some cool blog about the never-ending surfer life. If this describes you, go here instead. Peace out, dude. 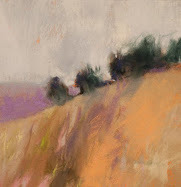 Look to this new blog for promotional info about my summer art fair venues. Who knows? Maybe we'll share a beer somewhere out there on the open road, or if nothing else I may yet get my legs to tan before the summer is over. Sometimes our peerage out in Blog-land have more valuable resources than the web at-large. 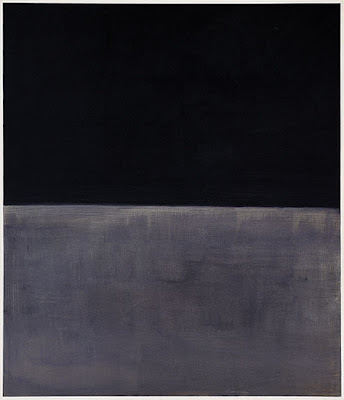 A very nice, clear collection of jpegs from the Rothko corpus. A must see. I particularly like Tentacles of Memory, which reminds me of a Mark Tobey type of work. 2. A not-as-yet published monograph about Rothko, by French author Geneviève Vidal. 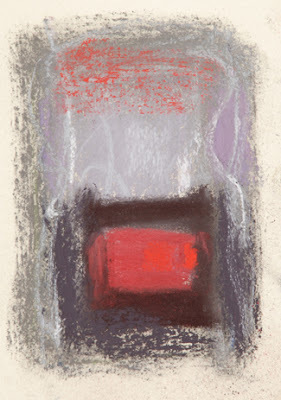 She considers that Rothko, by his universal dimension, is "the painter of our becoming". 3. Looks like I've found my Thinking Blogger award recipient: Lessons in Art Appreciation, by blogger "Outre". Her live journal may be on hold, but she has given us a shotgun blast of artist after artist after artist. I like that. "the fact that one usually begins with drawing is already academic. We start with color", is a Rothko quote that she brings to us. 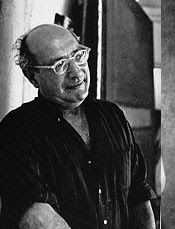 The American Friends of the Tel Aviv Museum of Art is pleased to announce that the first retrospective exhibition in Israel of works by Mark Rothko (1903 - 1970) will be on view from March 29 through June 30, 2007 at the Tel Aviv Museum of Art’s Sam and Ayala Zacks Pavilion. I just signed up for an e-mail alert for Mark Rothko entries on Google. Watch out, world. Messing around in Photoshop one day, I created this over a photo of myself. At first, I just filed it under: "whatever", but when I saw it yesterday I did like it. It may or may not "read" better than the B&W of me at the easel that I used before. The full-faced images that Corrine Bayraktaroglu (Jafabrit), Nicole Caulfield and Maggie Stiefvater use are the best ones for really showing the artist's likeness. Why do I feel the need to have a "funny" looking image for my profile and comment icon? Thanks to all of my great friends and readers. While I'm so busy at ArtFest in Spokane, I'm running at full speed and my comments and e-mails are piling up. Juror Michael Monroe, Director and Chief Curator of the Bellevue Art Museum, former Curator-in-Charge of the Smithsonian American Art Museumʼs Renwick Gallery (Washington D.C.), and the past Executive Director of the American Craft Council, will select winners of over $3000 in media specific monetary and gift certificate awards. Selections are made during the first day of ArtFest. 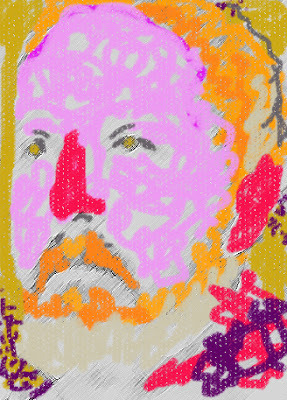 Mr. Monroe's expertise is in the area of modern art. I have been informed by the museum staff that this one needs to be in my resume with his name. Now I just have to figure out how to write that one up. You know me, I'm a big name-dropper and all.